This is a scenery package as real as the real one. This version is for X-Plane 10. Tested in X-Plane 10.42 in Windows 64 bit. 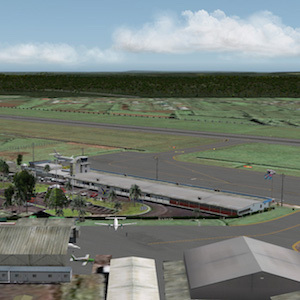 Nausori International Airport (IATA: SUV, ICAO: NFNA). Also known as Luvuluvu, Nausori Airport is the second International Airport in Fiji. It is situated in Nausori on the south-Eastern side of Viti Levu (Fiji’s main island). Nausori Airport is about 23 km (45 minute drive) from Fiji’s capital city, Suva. A 20-year Master Plan is being drafted for Nausori Airport that will include a complete refurbishment and upgrade of Fiji’s second International Airport, creating a facility for the international passengers and a domestic hub for Fiji. At one time Air Pacific (now Fiji Airways) had its headquarters on the property of the airport (Courtesy of WikiPedia). Unzip the file and place into your local custom scenery folder, path like this: /Xplane/Custom Scenery folder. Does not matter if runway follow terrain is off or not. Small differences… I prefer using ” runways follow terrain contour” ON !